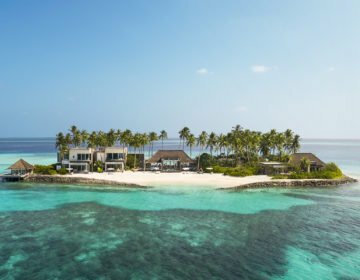 Nestled in the southern reaches of the Thaa Atoll, COMO Maalifushi is luxurious COMO Hotels and Resorts retreat and the only resort in the Maldives’ Thaa Atoll. Perched like a pearl in an untouched corner of the archipelago, the luxury boutique resort is accessible by a 60-minute seaplane transfer and right next to sister resort COMO Cocoa Island. 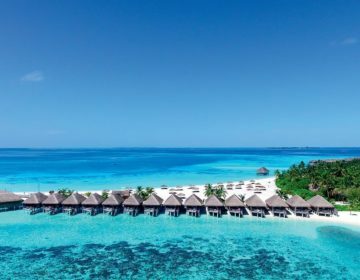 It features a stylish mix of designer over-water villas and beach suites with breathtaking views, three elegant oceanfront restaurants, and private dining experiences, the exclusive Como Shambhala Spa, and an array of activities and recreation. COMO Maalifushi is a surfer’s and scuba-divers paradise with some excellent breaks nearby and incredible untouched reefs that are home to turtles, manta rays, and hammerhead sharks. 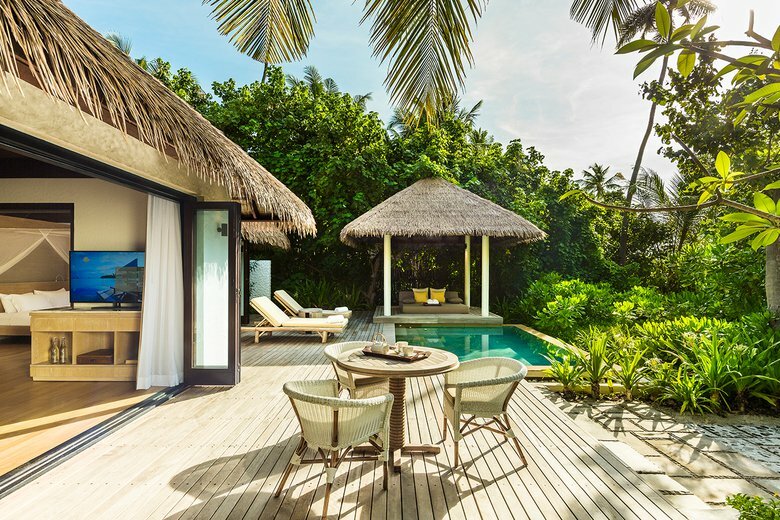 Beautifully appointed Crusoe-esque style villas, beach houses and expansive residences with thatched roofs are connected by timber walkways and overlook white sandy beaches and the shimmering azure waters of the lagoon. Villas are spacious and airy with stylishly decorated interiors of white and natural hues enhanced by splashes of color, and gorgeous outdoor decks with spectacular views. 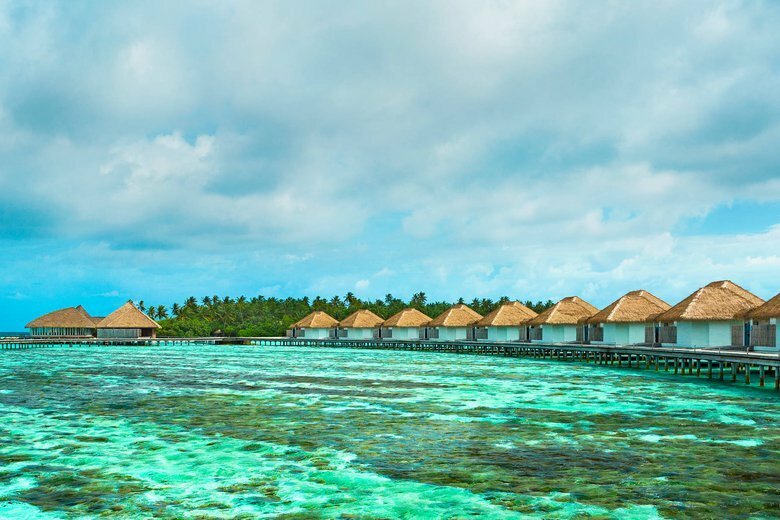 Over-water villas have private terraces for slipping into the sea, while garden rooms are nestled in the lush heart of the island, offering privacy and tranquility. Modern amenities in all accommodations include air-conditioning, antique colonial ceiling fans, Nespresso machines, 42-inch LCD plasma satellite televisions and DVD players, iPod docking stations, private bars and snacks, in-room safes, international direct dial telephones, and complimentary wireless Internet access. 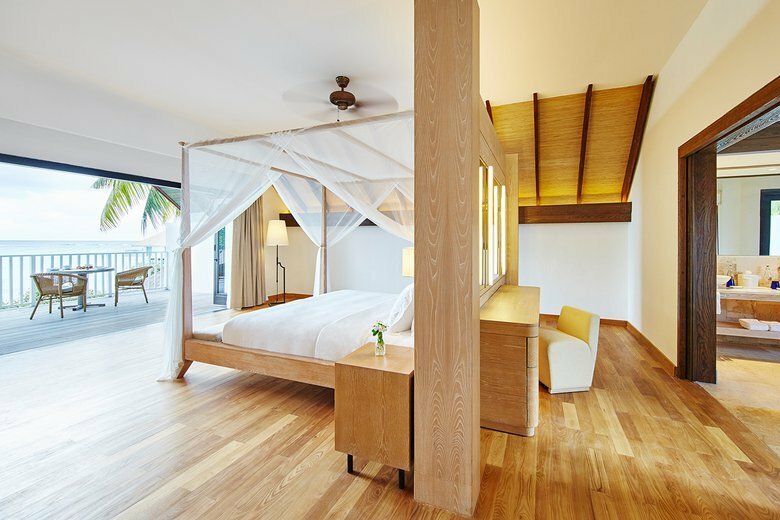 Located in the center of the island, shaded by the resort’s lush tropical greenery, Garden Rooms boast 775 square feet of space with open-plan interiors, designer décor, comfortable bedrooms with en-suite bathrooms and outdoor furnished decks for al fresco dining. Modern include air-conditioning, antique colonial ceiling fans, Nespresso machines, 42-inch LCD plasma satellite televisions and DVD players, iPod docking stations, in-room safes, international direct dial telephone, and complimentary wireless Internet access. 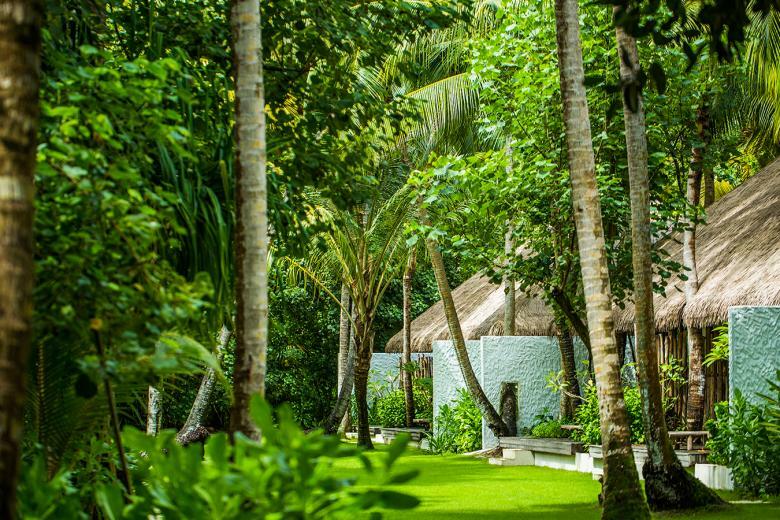 Nestled in the shade of COMO Maalifushi’s lush gardens, Beach Suites enjoy direct access to the beach and are spacious and private. The 1,087 square foot suites have floor-to-ceiling French doors that open out on to private terraces with swimming pools, airy living spaces with designer décor, bedrooms with separate living spaces and en-suite bathrooms with outdoor showers. Modern include air-conditioning, antique colonial ceiling fans, Nespresso machines, 42-inch LCD plasma satellite televisions and DVD players, iPod docking stations, in-room safes, international direct dial telephone, and complimentary wireless Internet access. One-bedroom Beach Villas offer 1,248 square feet of space with private access to the beach and their swimming pools surrounded by furnished sun decks. Elegant, simple interiors are flooded with light from floor-to-ceiling French doors, and bedrooms with separate living spaces have en-suite bathrooms with outdoor showers. Modern include air-conditioning, antique colonial ceiling fans, Nespresso machines, 42-inch LCD plasma satellite televisions and DVD players, iPod docking stations, in-room safes, international direct dial telephone, and complimentary wireless Internet access. To book these magnificent one-bedroom Beach Villas, click here. 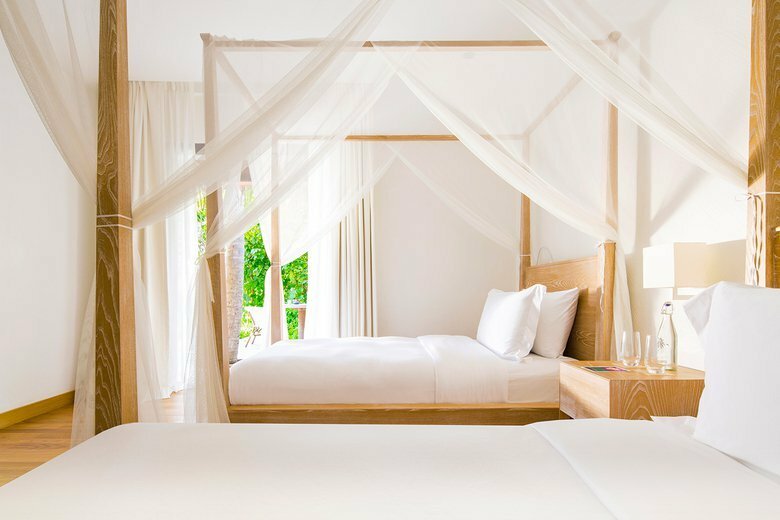 Sheltered in the shade of lush palms and tropical flora, Two-Bedroom Beach Suites offer the same facilities as the Beach Suites but with two bedrooms and slightly more space at 1,408 square feet. The second bedroom has twin beds and a smaller shower room, making it ideal for families. 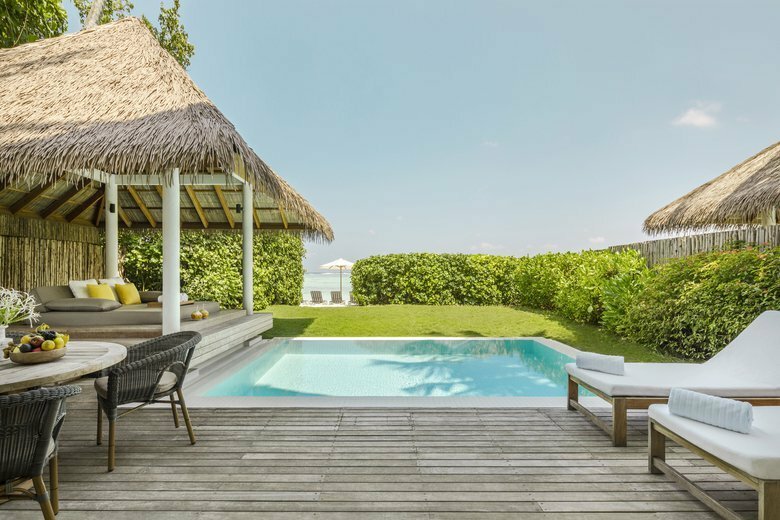 Luxurious Two-Bedroom Beach Villas are 1,560 square feet in size and enjoy private swimming pools and private beach access. Floor-to-ceiling French doors open out on to private terraces with swimming pools, airy living spaces boast designer décor, and two bedrooms have kings and twin beds with en-suite bathrooms with outdoor showers. Modern include air-conditioning, antique colonial ceiling fans, Nespresso machines, 42-inch LCD plasma satellite televisions and DVD players, iPod docking stations, in-room safes, international direct dial telephone, and complimentary wireless Internet access. A stylish two-bedroom duplex beach house offers 1,916 square feet of space and its grassy lawn and private beach access. Surrounding a large private pool is a secluded sundeck with sun loungers and furniture, and two bedrooms have kings and twin beds with en-suite bathrooms with outdoor showers. Modern include air-conditioning, antique colonial ceiling fans, Nespresso machines, 42-inch LCD plasma satellite televisions and DVD players, iPod docking stations, in-room safes, international direct dial telephone, and complimentary wireless Internet access. 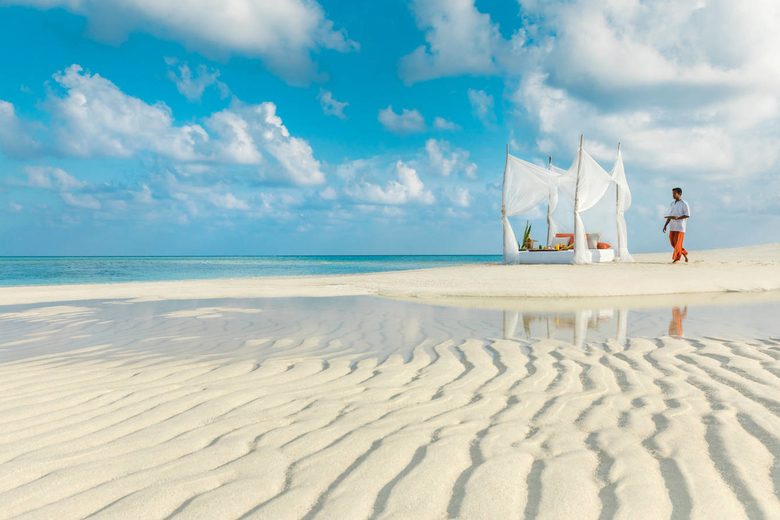 Spectacular Water Suites float out over the water on the stilts and have their jetty with panoramic ocean. Suites feature airy living spaces with designer décor, bedrooms with separate living spaces and en-suite bathrooms with sunken baths and outdoor showers. French doors that open out on to private terraces with plunge pools and direct access to the turquoise lagoon. Modern include air-conditioning, antique colonial ceiling fans, Nespresso machines, 42-inch LCD plasma satellite televisions and DVD players, iPod docking stations, in-room safes, international direct dial telephone, and complimentary wireless Internet access. 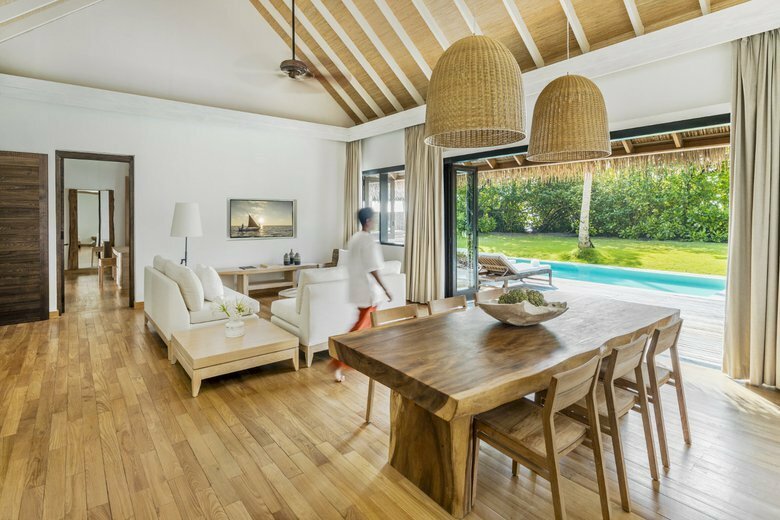 One-bedroom Water Villas offer 1,292 square feet of space with direct access to the lagoon and plunge pools surrounded by furnished sun decks. Elegant, simple interiors are flooded with light from floor-to-ceiling French doors, and bedrooms with separate dressing areas have en-suite bathrooms with sunken baths and outdoor showers. Modern include air-conditioning, antique colonial ceiling fans, Nespresso machines, 42-inch LCD plasma satellite televisions and DVD players, iPod docking stations, in-room safes, international direct dial telephone, and complimentary wireless Internet access. 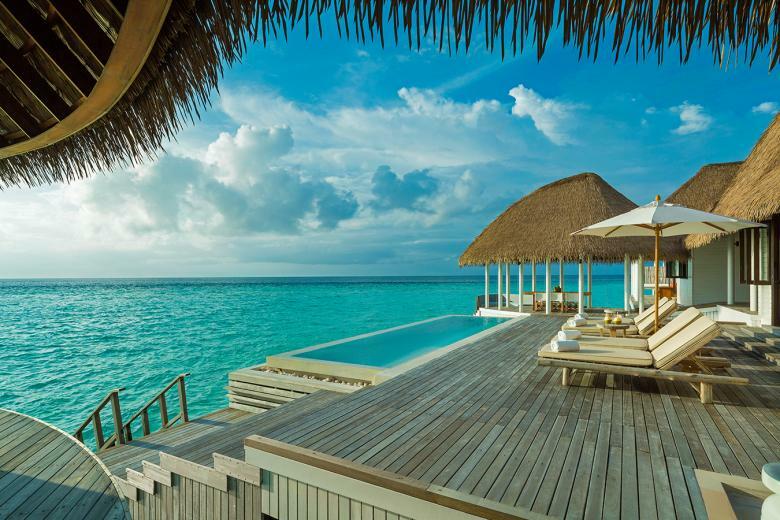 Book the incredible Water Villas by clicking here. 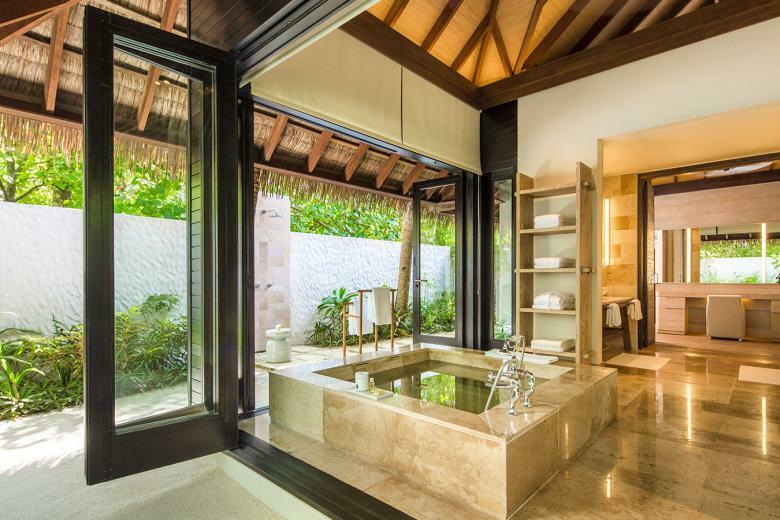 Boasting two sleek and stylish bedrooms with two doubles beds, and en-suite bathrooms with outdoor showers, the Maalfushi Beach Villa is a study in comfort and style. 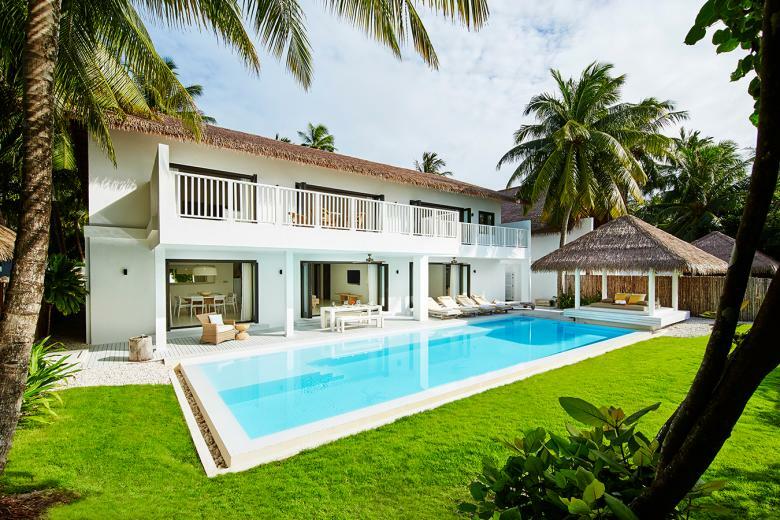 Spanning 3,186 square feet and offering endless ocean views, the villa has a manicured grassy lawn and large swimming pool with a sundeck, sun loungers, and outdoor furniture. Modern include air-conditioning, antique colonial ceiling fans, Nespresso machines, 42-inch LCD plasma satellite televisions and DVD players, iPod docking stations, in-room safes, international direct dial telephone, and complimentary wireless Internet access. 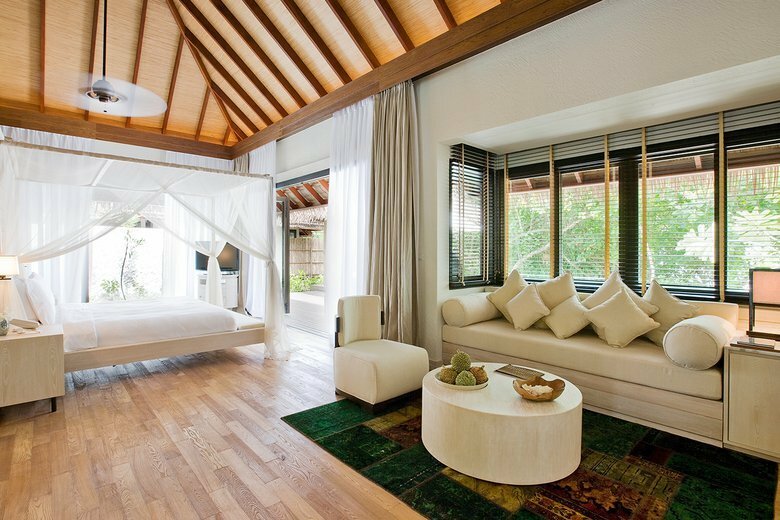 A full butler is available with the Maalfushi Beach Villa. One of COMO Maalifushi’s most spectacular over-water villas, the Maalfushi Water Villa has its secluded jetty, private pool and sundeck, and a dedicated butler. The over-sized, two-bedroom, light-filled bungalow features designer décor, stylish en-suite bathrooms with sunken baths and outdoor showers, and modern such as air-conditioning, antique colonial ceiling fans, Nespresso machines, 42-inch LCD plasma satellite televisions and DVD players, iPod docking stations, and complimentary wireless Internet access. The luxurious two-story four-bedroom COMO Residence offers all the creature comforts that one would expect from a boutique COMO resort, ranging from contemporary living areas with designer décor and state-of-the-art technologies to full kitchens, comfortable bedrooms with en-suite bathrooms and sundecks with loungers and outdoor furniture. The 3,832 square foot residence enjoys modern amenities such as air-conditioning, antique colonial ceiling fans, Nespresso machines, 42-inch LCD plasma satellite televisions and DVD players, iPod docking stations, and complimentary wireless Internet access, and has private butler services. Enjoy a once-in-a-lifetime experience in the luxurious two-story four-bedroom COMO Residence – book here. 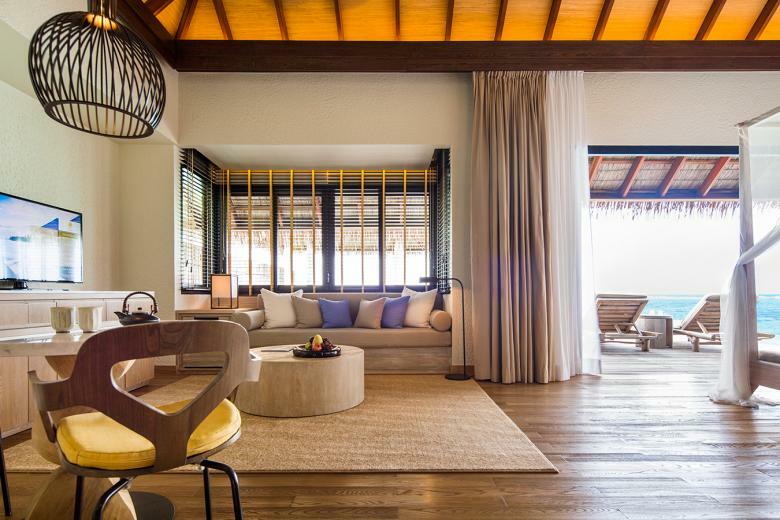 The opulent two-bedroom over-water COMO Villa offers COMO Maalifushi’s ultimate luxury experience. 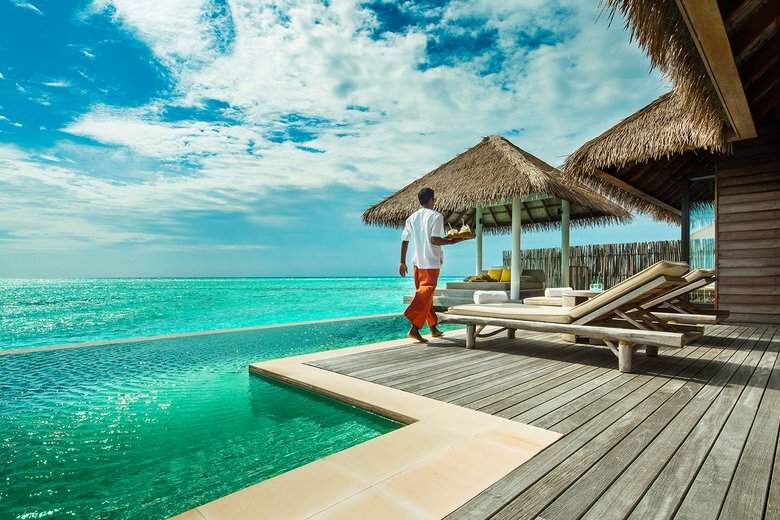 The spectacular 4,392 square foot villa floats above the lagoon with an expansive sun deck, a private pool and enjoys personalized butler services. Elegant, simple interiors are flooded with light from floor-to-ceiling French doors, and bedrooms with separate dressing areas have en-suite bathrooms with sunken baths and outdoor showers. Modern include air-conditioning, antique colonial ceiling fans, Nespresso machines, 42-inch LCD plasma satellite televisions and DVD players, iPod docking stations, in-room safes, international direct dial telephone, and complimentary wireless Internet access. 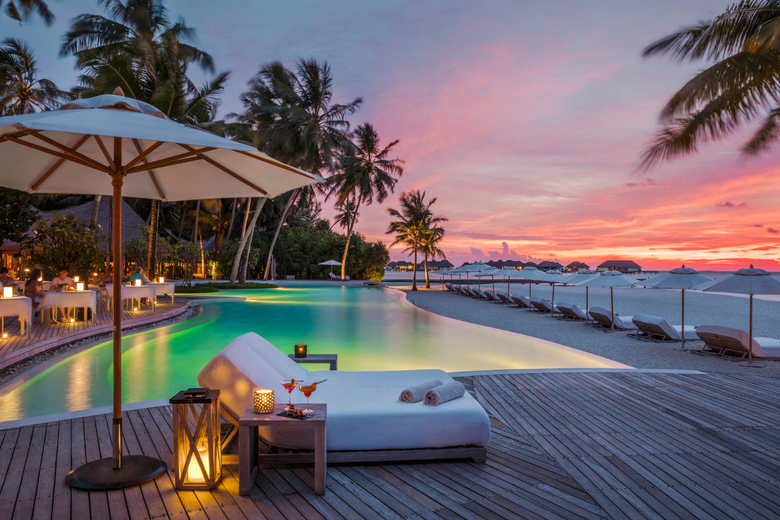 Savor a range of gourmet cuisine at COMO Maalifushi ranging from contemporary interpretations of other Asian and Mediterranean classics to mouthwatering South Indian cuisine, fresh salads, and catch-of-the-day seafood. Housed in a thatch-roofed, open-sided building, all-day diner Madi draws inspiration from the region’s fresh produce and island setting to create a range of local, Mediterranean, Indonesian and Thai-influenced dishes. Madi’ (meaning Manta Ray in the local Dhivehi language) is open from breakfast to late evening and hosts three themed nights each week, including a ‘Middle Eastern Feast’ night on Mondays, ‘Taste of the Indian Ocean’ on Wednesdays with traditional Maldivian Boduberu dancing and drumming, and a seafood barbecue beneath the stars to the sound of live music from local musicians on Friday nights. Guests who want to maintain healthy holiday habits can sample Como Shambhala cuisine, a selection of raw, steamed and grilled dishes available at Madi and included in the room service menu. 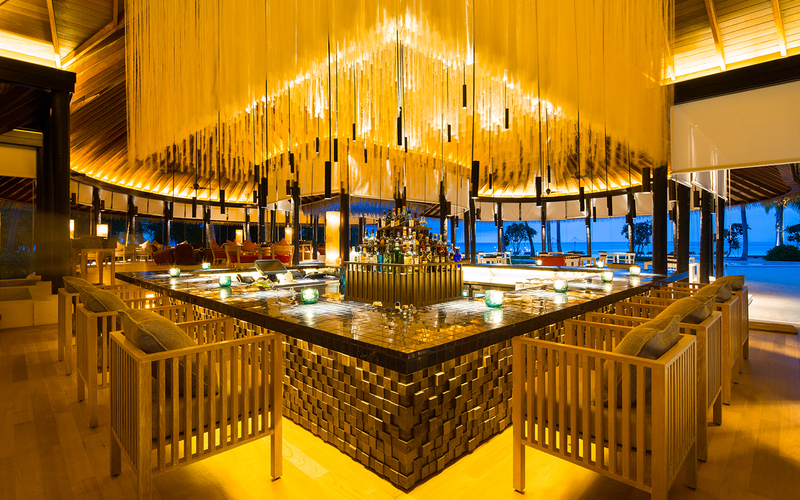 ‘Tai’ (Japanese for red snapper), a celebratory fish in Japanese culture, is a contemporary oceanside restaurant that focuses on sustainable, locally-caught seafood from the Indian Ocean. 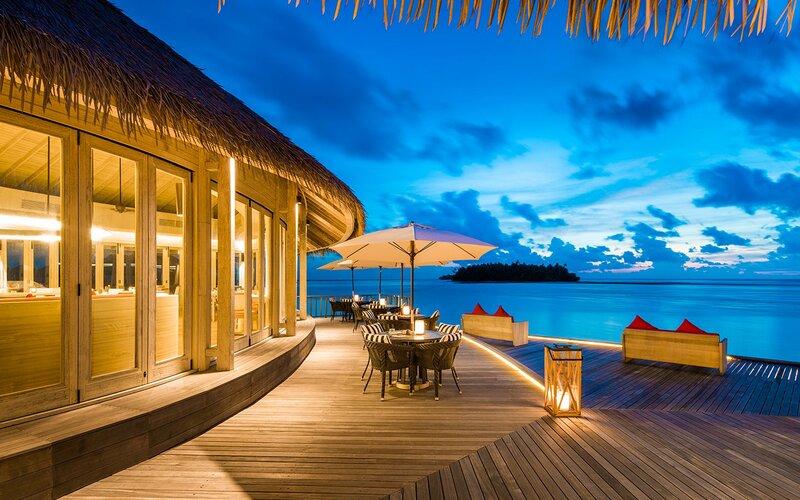 A cocktail bar boasts stunning views of the Maldivian sunset and Tai is open six days a week except for Fridays when a seafood BBQ is offered on the beach between Madi and Thila. 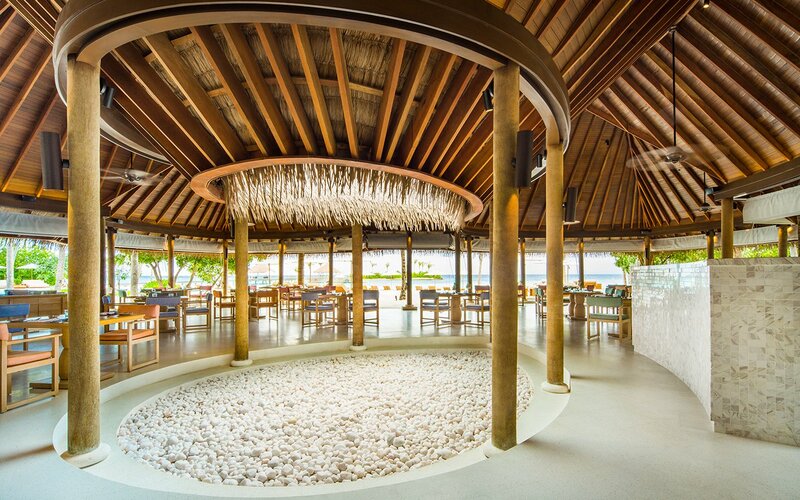 Named after rock formations in the Maldives that are covered with abundant marine life, Thila is an informal restaurant and pool bar that serves salads, freshly cooked seafood, and pizzas. 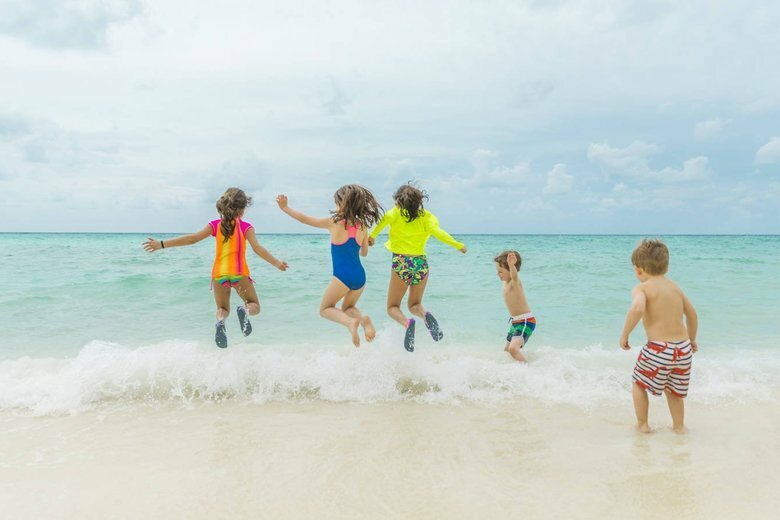 The family-friendly eatery provides entertainment in the form of pool tables, laid-back music and an open-air pool bar with ocean views. The exclusive and deluxe COMO Shambhala Retreat at COMO Maalifushi in the Maldives offers an unforgettable pampering experience. 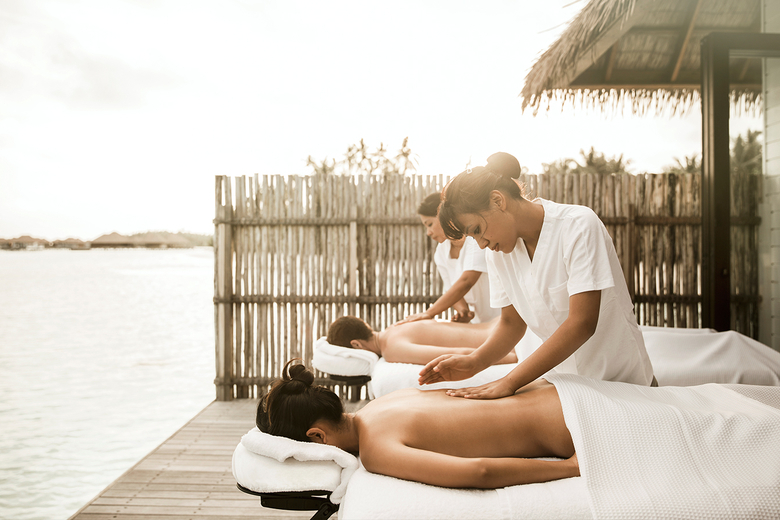 The luxury spa features eight double over-water treatment pavilions boasting breathtaking views, steam, sauna and Jacuzzi areas, and an open-air yoga pavilion on the sunrise side of the island, with stunning views of the Indian Ocean. The wellness center also has a state-of-the-art fitness center and offers expert instruction in yoga, meditation, and core connection. Treatments include Thai Massage, Taksu, and Indonesian Massage, Foot Reflexology and Indian Head Massage, along with classic beauty treatments, manicures, and pedicures. 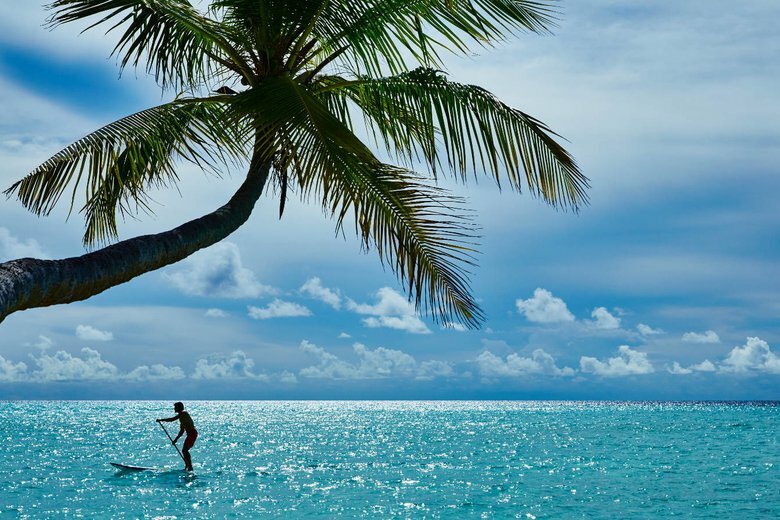 COMO Maalifushi offers a wealth of deluxe facilities and activities to enjoy. Designed to weave around ‘islands’ of palm trees, a 44-meter free-form swimming pool lies between the bar and restaurant and is surrounded by sun loungers and parasols. Water-based activities range from scuba diving, snorkeling, and swimming with manta rays to dhoni excursions, kayaking, and big game fishing. Enjoy day and night fishing charters, dolphin watching excursions, catamaran sailing, beach volleyball, and windsurfing. Guests can also take a sunset cruise on a traditional dhoni, or head out in search of dolphins, turtles, manta rays and other amazing marine life in a guided wildlife watching trip. 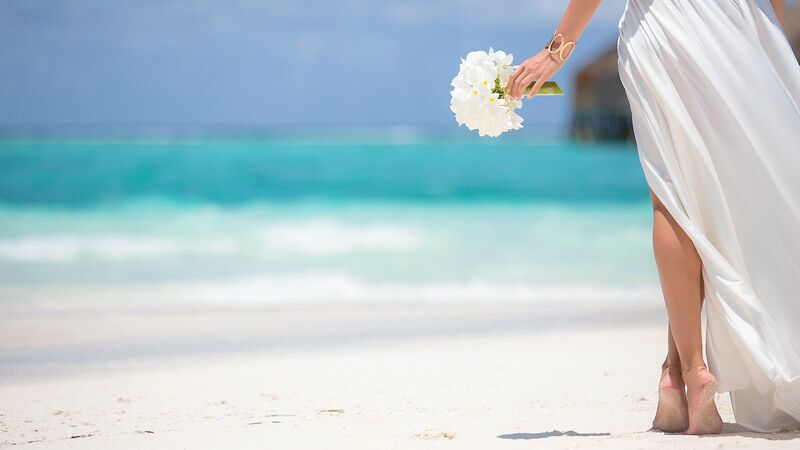 COMO Maalifushi provides the perfect island getaway for intimate weddings and honeymoon celebrations against a spectacular background of Indian Ocean views. Providing an idyllic setting for romantic weddings with beautiful venues for ceremonial blessings such as a dedicated wedding pavilion or the picture-perfect white sandy beach, COMO Cocoa Island has a professional team that plans and organizes all types of wedding ceremonies and receptions from start to finish and caters for every need. COMO Maalifushi features a dedicated Play by COMO Space designed to inspire creative and educational child-directed play for children aged four to 12 with a variety of books, games, art materials, and carefully-selected toys, books, games and art materials. 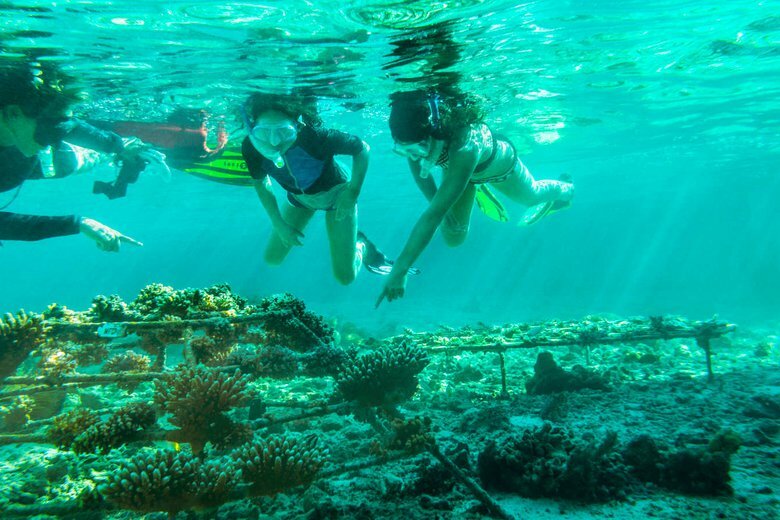 Sponsor a coral propagating frame and help the resort’s resident marine biologist plant it on the seabed at COMO Maalifushi’s coral garden. 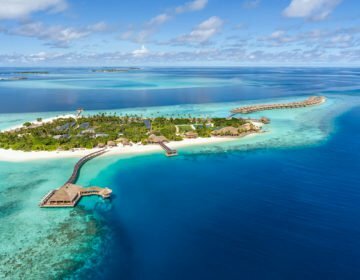 You will receive photographs and updates every six months after you have planted the frame so that you can watch your contribution to the Maldives’ ecosystem flourish.